This innovator sits alongside fellow Renaissance master, Leonardo da Vinci, as the two most influential members of this movement which helped bring about so much of what we enjoy in the art world today. Michelangelo.net aims to draw all the highlights of his career together in bite-size chunks, with more information available for those who want to look at elements of his life and work in more detail. For those new to the career of Italian Michelangelo, we have included several of his most famous works within the homepage so that you can quickly get an understanding of what he was about, and you will probably realise that you already knew some of it anyway. The modern media is flooded with adaptations of works by the likes of Michelangelo Buonarroti, Leonardo da Vinci, Raphael and many more Renaissance artists besides. Sebastiano was also a key influence on Michelangelo. Further on from modern media, these artists have also heavily influenced many artists who have followed on since. Some of these influences are starkly obvious, such as producing their own versions of classic artworks, whilst other influences maybe more general and subtle. As an introduction to the career of this extraordinary artist, please find below a summary of Michelangelo Buonarroti's career highlights, with more information available on each via the accompanying links. We have attempted to offer a comprehensive range covering various media in which he was involved, most notably paintings, sculptures, drawings plus also some inventions. A fuller list of the disciplines in which Michelangelo was involved during his career would include Sculptures, Paintings/Frescos, Drawings/Sketches, Architecture, Inventions and Poetry. Michelangelo's David sculpture came around in the very early stages of the 16th century and is considered one of the most impressive items of sculpture in the history of art. David took it's creator around three years to complete and was an important marker in the early stages of a career which was to continue to reach similarly great heights thereafter. This sculpture has significant symbolic value and served as a reminder of Florentine strength and determination at that time, despite the region's precarious geographical position against several competing states in Italy and abroad. It is claimed that the eyes of David were aimed in the direction of Rome as a warning as to the confidence which Florentines held in their ability to defend themselves against any attacks. The sculpture has been displayed in several different positions during it's existence and has become so valuable to art history that replicas may sometimes be shown instead, also partly due to an attack in 1991 which left the original with a small level of damage. The theme of the Pieta sculpture held clear Northern European origins of that period and was commissioned by French cardinal Jean de Billheres. All European art masterpieces have been subjected to incredible research and discussion ever sice their inception, and Pieta is no different in that regard. The significance of the Pieta sculpture, plus it's creator Michelangelo, has meant that the original intended location for it as a funeral statue has since been changed, so that it is better protected and also available for more people to see. Michelangelo Buonarroti chose to take this appearance of Christ here in a new direction to how many other Italian artists had done previously, looking to avoid the theme of death as the sole theme of the work. Our specific section on Pieta underlines the artistic qualities of the sculpture and also covers any controversial discussions which have surrounded it in the years that have passed since. The Ceiling of the Sistine Chapel contains some of the finest European art in history. Michelangelo took on one of his most challenging commissions here and put together a collection of intricate frescos which worked together perfectly. The monumental task completed by Michelangelo spanned across five years at the start of the 16th century, and was the sort of project which demanded an artist with the reputation and confidence of someone like Michelangelo. The Last Judgement, pictured to the right, was placed on the Altar wall, and adjoins the ceiling. Michelangelo added this fresco several decades later in a separate commission. The Sistine Chapel was left as an absolute must for art fans around the world to visit and in the modern era there has been a greater effort to protect their beauty for future generations. Renaissance art continues to be relevant to new artists who recognise the achievements made by the likes of Michelangelo. The Creation of Adam is the centerpiece of the stunning ceiling in the Sistine Chapel. Michelangelo Buonarroti spent many years completing this elaborate series of frescos which proved controversial at the time, but have remained key elements of art history ever since. This artwork has been re-purposed in all manner of different ways across modern media but the original very much remains the best, and this scene is the most recognisable element of all the art found in the Sistine Chapel. Our specific page devoted to The Creation of Adam will underline where this painting fits into the overall series of frescos as well as discuss the obvious symbolism which is to be found here. The Last Judgement was a fresco by Michelangelo which is in the Sistine Chapel, but came many years after his work on it's ceiling. This artwork sits on the Altar Wall and has immense detail throughout, explaining why it is believed to have taken the artist around seven years in total to complete. Our specific page devoted to The Last Judgement features greater information on the fresco as well as images which contain the entire piece, rather than just the main focal point which you can see included here. An interesting element to this fresco was the way in which Michelangelo chose to portray Christ, which was not in keeping with how other artists had traditionally captured this religious icon. Later amendments were made, however, because of the scant nature appearance of the artist's main figures which was not entirely palatable to some members of the Vatican Church. Michelangelo was one of several architects to have contributed to St Peter's Basilica. St Peter's Basilica remains the most prestigious and artistically impressive piece of architecture that Michelangelo was ever to have worked on. 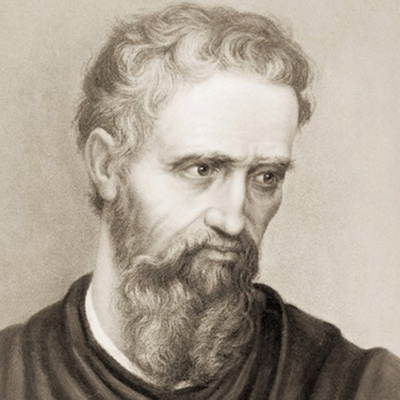 Michelangelo received the role of Capomaestro in 1547 and took on existing plans for the building, taking them through to a stage where development had begun and a good level of the foundations had already begun. This ensured that Michelangelo's touches were to remain in the ongoing work of the building, even after his death. St Peter's Basilica is regarded by many as the finest piece of Renaissance Architecture from that entire period. Moses was a full length sculpture created by Michelangelo in 1515. The photograph to the right shows the top half of the artwork, and the incredible detail which the sculptor managed to produce. The original sculpture remains in great condition and can be found at the San Pietro in Vincoli in Rome. Several Michelangelo sculptures have deteriorated over time but now receive the finest of care in order to best preserve all of his career that remains. Pope Julius II requested artist Michelangelo to work on elements of his tomb, which was clearly a very high level commission to receive during that period of the Italian Papal States. Moses was created in Marble, which was one of the artist's preferred mediums to work with. The tomb was to include this sculpture alongside many others in a truly elaborate layout which was befitting of the Pope's status. The Conversion of Saul is an inspiring fresco from 1545. This fresco features a similar level of detail and activity to The Last Judgement and also The Crucifixion of St Peter, which was Michelangelo's very next artwork. This artwork from Michelangelo can now be seen at the Cappella Paolina, Vatican Palace in Vatican City and is a typically huge fresco, around 6 metres wide by 6 metres tall. It is somewhat rare in the modern day to see artists produce such large paintings, but can still occur from time to time. The scale of this work reflects the fact that it took around three years for Michelangelo to complete. The sculptured bust of Brutus was commissioned by Donato Gioanotti in 1538. The importance of this piece cannot be overestimated when considering that it remains the only bust to be completed by Michelangelo, himself one of the finest sculptors in art history. The stunning photograph to the right shows a closeup of the bust sculpture, with lighting providing shadows across the contours of the artwork, indicating where Michelangelo went deepest into the marble. It is believed by many that Michelangelo used Brutus as a way of indicating his displeasure with the ruling powers of Florence at the time, but without being so blatant as to get himself into trouble. In using this figure as a representation of freedom and justice, he was directly commenting against those who he felt opposed these ideals. Michelangelo's choice of subjects for his sculptures and frescos can almost be a lesson in history in itself. Bacchus is a marble sculpture which came around in 1497 and took around a year to complete. Sculptor Michelangelo attempts to portray the well known Roman God as being drunk, and is another example of how ths artist liked to tackle common topics with his own perspective. This sculpture is another example of how Michelangelo was adept at capturing the human body so beautifully and technically correctly in his sculptures. David is another obvious example alongside Bacchus of his technical ability to sculpture the physical body with style and precision. The detailed photograph of The Creation of Adam is currently the most popular Michelangelo artwork chosen for reproduction. There are, however, many others to choose from in the gallery which is linked to from this website. Photographs of his sculptures are also very popular choices, as well as detailed photographs of other elements of the Sistine Chapel. Michelangelo and Leonardo da Vinci artworks remain the most reproduced of all original art from the Renaissance era, which reflects their importance as artists, but in recent years there has also been a growing interest in modern modern artists and movements, such as Romanticism, Abstract Expressionism and Post Impressionism. Our biography offers an excellent summary of the key moments in the life of artist Michelangelo, covering his birth and childhood, distinguished career and everything else up to his death many years later. Students plus anyone else looking to quickly understand more about him would be advised to check this out first before looking through the other areas of the website afterwards. You can find the Michelangelo biography here, and it is organised by year and decade. Michelangelo produced a wealth of sculptures during his lifetime, making it his signature art medium, even ahead of the frescos from the Sistine Chapel and some of the architectural plans which were used for buildings still standing today. Beyond the best known works such as Pieta and David, there are many alternative sculptures to enjoy with in this section of the website which covers this particular medium in full, aiming to provide a full summary of the artist's catalogue of sculptured art. You can find out more about Michelangelo sculptures here, with each work presented with key information and resources to learn more about each one. Michelangelo paintings included the ceiling of the Sistine Chapel, which remains one of his biggest career highlights. The level of detail across this work was extraordinary and individual elements of it are considered masterpieces in their own right, such as The Creation of Adam which was one of the centerpieces of the overall piece. Michelangelo was to later return, several decades later, on a new commission in the Sistine Chapel which was to be The Last Judgement fresco which lifted the artistic qualities of this location even higher. Several more years of his life were spent working on this piece after the new commission had been agreed. Michelangelo drawings and sketches provided the basis for so much of the artist's career, be it study pieces for upcoming frescos, outlines for new inventions or architectural plans. Recent focus has been drawn on his substantial natural drawing skills with many exhibitions covering this element of his career alone. Original sketches without further work show us the raw talent of the artist through sketched detail in portraits, buildings and anatomical studies. Most Renaissance followers will find a lot to their tastes with in the career of Michelangelo, and his influence on later artists across many artistic media cannot be denied. The most notable architectural commission for Michelangelo was to complete work on St Peter's Basilica. Several key artists devoted years of their life to completing this project and pushing the work of previous designers ever onwards. Several other key architectural plans produced by Michelangelo were sadly not to be realised but enough were that he can be considered a highly significant Renaissance Architect. You can find out more about Michelangelo architecture here, including architectural drawings and further detail on the specific projects in which he was to become involved. Michelangelo was not an inventor in quite the same way as Leonardo da Vinci but he did produce many significant drawings based on new and developing products, many of which were to come to fluition. Invariably, the artist was to be commissioned to help out with the artistic side of new machines but he is not known to have actually come up with the original ideas himself. You can find out more about the topic of Michelangelo inventions here, which tend to be detailed drawings illustrating several complex machines and products of that era. Literature, particularly poetry, was another significant area of interest for Michelangelo. The Renaissance movement itself included many valuable contributions to Literature and marked important developments in this artistic category. There is information on Michelangelo poetry here, and this includes a focus on around ten of his best known literary contributions. Whilst the artist remains best known for his sculptures and frescos, poetry was another impressive string to his bow.